Is the UK set for a hummingbird summer? Wildlife lovers are being asked to check their gardens for ‘hummingbirds’ in a bid to find out if one of the world’s most striking moths is attempting to colonise the UK. The unmistakeable Hummingbird Hawkmoth, which is found on the Continent, beats its wings 80 times per second, which allows it to hover with hummingbird-like precision over flower heads. 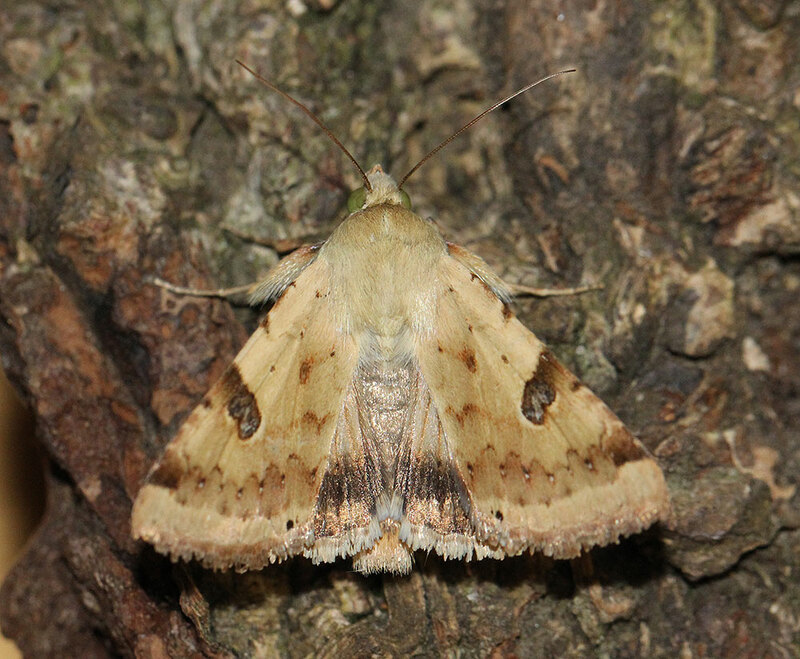 Typically only a summer visitor to the UK, in recent years the warming climate has seen the day-flying moth successfully overwinter in greenhouses and sheltered locations in southwest England. There have been large influxes of the moth in 2000, 2006 and 2011 and hopes are high that 2016 could witness another ‘hummer summer’ as the long-distance migrant attempts to gain a foothold in the UK. Spotting a Hummingbird Hawkmoth has long been considered a good omen – a small swarm of the orange-and-brown moths was famously seen flying over the Channel on D-Day in 1944. As part of this year’s Moth Night celebrations, organisers Butterfly Conservation and Atropos, are asking the public to look out for the Humming-bird Hawk-moth in order to build a clearer picture of its UK distribution. Other hawkmoths to look out for include the spectacular Elephant Hawkmoth, a salmon-pink and olive-green beauty common in gardens across the UK. The Pine Hawk-moth is another species that has thrived and spread northward in recent years as it has benefited from the increase in conifer plantations. Hummingbird Hawkmoth, from Field Guide to the Moths of Britain & Ireland app. Some hawkmoths are skillful mimics. Both the Broad-bordered and Narrow-bordered Bee Hawkmoths resemble bumblebees but can be told apart by their longer antennae, greater agility and quieter hum. All of these species of hawkmoth – along with all the other British moth species you may encounter – can be found in the Field Guide to the Moths of Britain & Ireland app. Moth Night 2016 runs from 9 to 11 June and will include moth trapping events across the UK. Field Guide to the Moths of Britain & Ireland is available to download from the App Store. Stuck in holiday traffic? Try some mammal recording! Heading back home after a Christmas with the family? Why not contribute to The Mammal Society’s new National Mammal Atlas? It is not unusual to see a rabbit nibbling at the well-tended grass on a roundabout, or deer grazing peacefully alongside the motorway, and mammal spotting provides free distraction to bored children (or adults!). Providing the first review of where mammals are found for more than 20 years, the National Mammal Atlas is a crucial step towards conserving many species. The freely available Mammal Tracker App (downloaded from your app store or from our website, where you can also submit mammal records) makes recording mammal sightings or their signs simple and convenient. Mammals are, perhaps surprisingly, one of the most under-recorded groups of wildlife in Britain. The National Mammal Atlas seeks to change this and pinpoint the species, and the locations, where our conservation efforts are needed most. But the dataset is not yet complete! The Mammal Society is calling for any wild mammal records to be submitted for inclusion in the Atlas. Many mammals are still out and about at this time of year and are easy to spot. Records of mammals that are considered common, such as rabbits, Grey Squirrels, moles, are all valued alongside those of rarer species like Red Squirrels and Pine Martens. Ideally, mammal records should be submitted with a photo to aid in identification. Many records submitted are not direct sightings, but are evidence of mammal presence such as tracks, feeding evidence such as nibbled nuts or feeding stations, nests or droppings. Some mammals and their signs are difficult to identify, but all records are verified by our experts, so every record submission counts towards UK mammal conservation. So, with that in mine, we've ditched the snow (photoshopped or otherwise) on this year's Christmas video-card and instead gone for something a bit... dustier. Merry Christmas and a happy new year from all at NatureGuides! We've just released an update to our Birds of Brazil app, based on the book of the same name by Ber van Perlo. The app still contains the same comprehensive content as the previous version – including illustrations, photographs, songs & calls, maps, and text – but it now has a clean new look and a number of new or improved features, like a comparison mode to compare species side-by-side. If you already own the Birds of Brazil app, the update will be free and will install automatically if apps are set to automatically update on your iPhone or iPad. If you don't already own the app, you can purchase it from the App Store. The State of the UK's Butterflies 2015 was launched yesterday at an evenat at ZSL London Zoo. The report, by Butterfly Conservation and the Centre for Ecology & Hydrology (CEH), found that 76% of the UK's resident and regular migrant butterflies declined in abundance, occurrence or both over the last four decades. It also found that a number of widespread species such as Wall, Essex Skipper and Small Heath now rank among the most severely declining butterflies in the UK. On the other hand, the findings also reveal that intensive conservation efforts have started to turn around the fortunes of some of the UK's most endangered butterflies. During the last ten years the numbers of the threatened Duke of Burgundy have increased by 67% and Pearl-bordered Fritillary has experienced a 45% rise in abundance. Dingy Skipper and Silver-studded Blue have shown 21% and 19% increases in occurrence respectively and even the UK's most endangered butterfly, High Brown Fritillary, has been relatively stable over the past decade. But despite breakthroughs with some threatened butterflies, the report revealed that other species continue to struggle. The long-term declines of the Wood White, White Admiral and Marsh Fritillary show few signs of stopping. The report found that some once common and widespread species have become a cause for concern. The Wall, once a common farmland butterfly across southern Britain, has suffered a 36% fall in occurrence and 25% drop in abundance since 2005, continuing a longer trend of decline. One of our most abundant species, Gatekeeper, has experienced a 44% decline in abundance in the last decade and numbers of Small Skipper have been below average in every year of the 21st century. The deterioration of suitable habitats due to agricultural intensification and changing woodland management are seen as major causes of the decline of butterflies that are habitat specialists. Decreases of butterflies found in the wider countryside are less well understood; climate change and pesticides may be playing a more harmful role in their declines than previously thought. The report reveals a north–south split among butterflies of the wider countryside, with species in England declining and those in Scotland showing no long-term trend. Less severe habitat damage in the north and the differing geographical effects of climate change are believed to be behind the split. The report reveals that more butterflies are reaching the UK from overseas. Since the 1970s the three common migrant species — Clouded Yellow, Red Admiral and Painted Lady — have all increased dramatically in abundance. In the last few years rare migrants such Scarce Tortoiseshell and Long-tailed Blue have arrived in unprecedented numbers. Butterfly Conservation Vice-president Chris Packham said: "This report reveals that UK butterflies are in real trouble. Yet again we are presented with sobering evidence that our much-cherished wildlife is in dire straits. "As a society we are guilty of standing idly by as once common species, never mind the rarities, suffer staggering declines. This is a situation that should shame us all. The future of the UK's butterflies does not have to be bleak. This report shows conservation work can and does turn around the fortunes of our most threatened butterflies." Richard Fox, lead report author and Butterfly Conservation's Head of Recording, added: "Thanks to tens of thousands of people who help to count butterflies in the UK each year, we have a clear picture of the changing fortunes of these captivating insects. "Overall the situation is stark. Most butterflies have decreased since the 1970s and an alarming number of common species have declined severely. On the other hand, trends over the past decade provide grounds for optimism and show that our approach to conserving threatened butterflies can stem and even reverse declines." David Roy, who led the CEH contribution to the report said: "We've used sophisticated analyses for this latest report, revealing major declines. This is of great concern not just for butterflies but for other wildlife species that share the same habitats. The findings act as a barometer of the overall state of the environment." The report comes from data gathered by two long-running citizen science projects — the Butterflies for the New Millennium (BNM) recording scheme and the UK Butterfly Monitoring Scheme (UKBMS). The Mammal Society is very proud to have received the John Sawyer National Biodiversity Network (NBN) Open Data Award. This acknowledges the large contribution the society makes to understanding UK mammals, managing their conservation, and making this information freely available to others through the hard work of volunteers. However, the hard work involved in collating data for the National Mammal Atlas is not over yet. Data collection for the Atlas is still continuing until the 31st December 2015, and anyone can contribute. The Mammal Society are asking anyone that has seen mammal signs or the mammals themselves to get involved by visiting the website or downloading the free Mammal Tracker App and submitting your records of mammal sightings and signs by web or by phone. The mammal species with the most records submitted for the Atlas through the Mammal Tracker App is the rabbit, closely followed by the Grey Squirrel, both of which are convenient to photograph by mobile phone. However, many records submitted are not direct sightings, but are evidence of mammal presence such as tracks, feeding evidence such as nibbled nuts or feeding stations, nests or droppings. Some mammals and their signs are difficult to identify, but all records are verified by our experts, so every record submission counts towards UK mammal conservation. Thinking of traveling, or looking to catch up with some scarce species in the UK this autumn? Our iBooks may be just what you're looking for. We offer three excellent iBook titles: Lee Evans' Ultimate Site Guide; David Simpson's Birding Dordogne site guide (also available in French); and Josh Jones' Birding Western Ireland. These titles are available to read on both iPhone and iPad, and can be downloaded from the iBooks store. We caught a Leopard. In Acton. A Leopard Moth, I mean... Still, an impressive beast! And secondly the spots, which were – viewed up close – a very attractive metallic blue, neatly set off by their fluffy white surround. The Butterfly Conservation's Big Butterfly Count 2015 is well underway. In celebration, we've dropped the price of our Butterflies of Britain & Ireland App – with artwork by Richard Lewington – to just £1.49 for the duration of the Big Butterfly Count. The offer ends on 9th August 2015. You can download the app now from the App Store. Last night's roof-top moth trap was a relative success with several interesting species caught. Pick of the lot was a Tree-lichen Beauty. 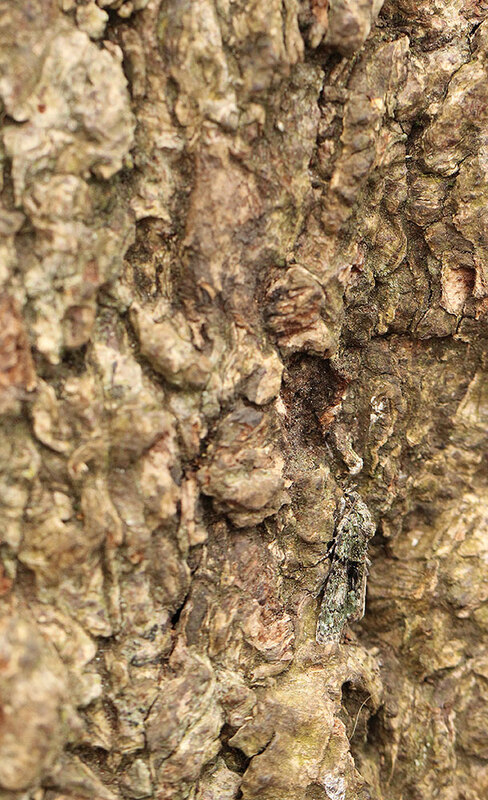 Normally when we take moths to our "studio" (= piece of bark at the back of the office), they do their best to get away. Not the Tree-lichen Beauty, which shuffled around for a minute before nestling into a small cranny – where it became surprisingly hard to spot. Our most notable moth this week – a Bordered Straw – didn't come from the moth trap; it flew in through my kitchen window late in the evening. Bordered Straw is a migrant, arriving each year in variable numbers, some suspected as coming from as far away as north Africa. This individual was relatively fresh so probably hadn't come so far, but exciting – and attractive – nonetheless.